In his speech at the National Palace’s warm and colourful send off ceremony in honour of Africa’s Delegation to COP15 on 12th December, Africa’s Chief Climate Change Negotiator, Prime Minister Meles Zenawi, asked for “a bucketful of good luck because I need it in the days ahead.” It does look, does it not, that Africans must have been cascading him with ‘a Victoria Falls’ of good luck for how else could he have managed to navigate safely through the chaotic and ‘booby-trapped’ talks, and talks about talks in Copenhagen. Indeed, his sterling brinkmanship radiated such a beacon of hope to all and sundry that it caused accolades to flow from Barrack Obama, Nicholas Sarkozy, and Gordon Brown and from the world’s most effective environmental activist group dedicated to the issues of climate change, Green Peace. Not to mention, of course, the full backing he secured from Chinese President Hu Jintao before he even set off for Copenhagen. Meles was almost certain of his anticipation that a treaty to replace the Kyoto Protocol was to be a pipe dream long before he set off to Copenhagen. His prediction, here, proved spot on. He, however, was fervently desirous of not returning home empty-handed; for a COP15 devoid of a binding deal on compensation for Africa, was to Meles, a luxury that Africa could ill afford. On that point, too, he had hit the bull’s eye. Experts in negotiations are of one mind on the recipe for a successful outcome from a negotiation laden with hard bargaining: first enter with a bulging demand and then gradually scale down one’s expectations without scaling down one’s principles. And that is precisely what Ethiopia’s pragmatist Prime Minister had achieved for Africa at COP15. In trying to fathom Meles’ tireless efforts at striking a deal that is good for Africa in terms of prescribing the source of funding, securing the timely flow of “real money as opposed to phoney money”, guaranteeing a hands-on role for the African Development Bank at the envisaged Board of Trustees; the proverbial saying “that which cannot be butter, must be made into cheese” springs to mind. 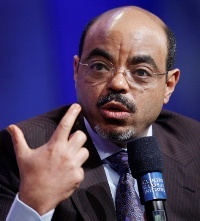 In an ideal negotiating milieu, nothing would have made Meles more elated than turning ‘milk’ into Sheno Butter at COP15, but given the very restrictive room he was forced to manoeuvre in, instead of discarding the ‘milk,’ Meles had wisely chosen to turn the milk into a nourishing Danish Cheese and offer it to his 52 African counterparts the majority of whom accepted it as the best possible deal under the circumstances. Meles Zenawi’s baptism of fire as Africa’s Chief Climate Change Negotiator has, without a shadow of a doubt, resulted in victory both for Africa and Ethiopia. Meles is now in possession of cast iron guarantees from mega carbon emitting nations of the world that real money – not the usual pie-in-the-sky pledges – would flow to Africa to withstand the rigours of climate change mitigations and adaptations.